Bass fishing from a Charter Boat is much the same as Bass Fishing from the Shoreline, be that an Estuary or rocky headland everyone wants to keep secret - location and state of tide can be everything, but even then you need to present the right lure / bait and in turn present that at the right speed and depth. Get those factors right without a doubt your have a great days fishing. 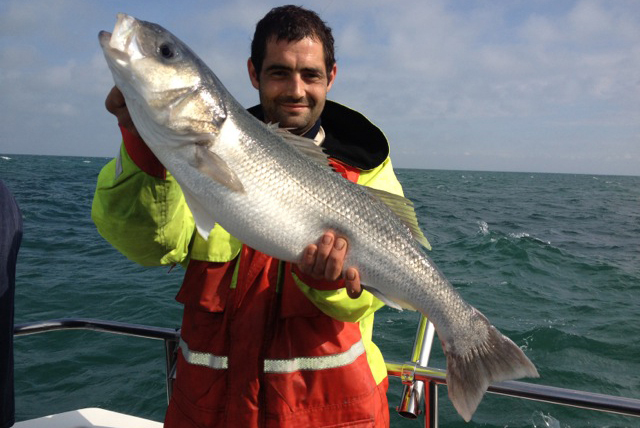 Getting the location right is something for the Skipper to worry about, both Zac and Glen have fished the grounds out of Hayling since boyhood and both have marks and tricks that produce fish year on year. You could say getting on board Valkyrie is the first steps in you getting the Location right. Mostly likely you'll be fishing the French Banks, the Overfalls, the Middle Ground or one of the many other marks to the East of the IoW (East of Wight) along the Hampshire Coastline. Over the last few years we've seen more and more anglers reverting to light gear for Bass fishing, something the French have perfected and something that should be encouraged in the right conditions. The Rod should be in the 6-8lb class with a forgiving tip but able to move 2-4oz leads around the bottom with bowing over. Oddly enough the gear used for Plugging Bass from the sure isn't too far wrong for fishing over shallow banks with light 15lb braid and 20lb Fluorocarbon leaders. The best reel you can afford is a must as the smoothness of the drag will improve your fishing experience and result in less fish losses. Setting the clutch to match the gear can equal so much fun. 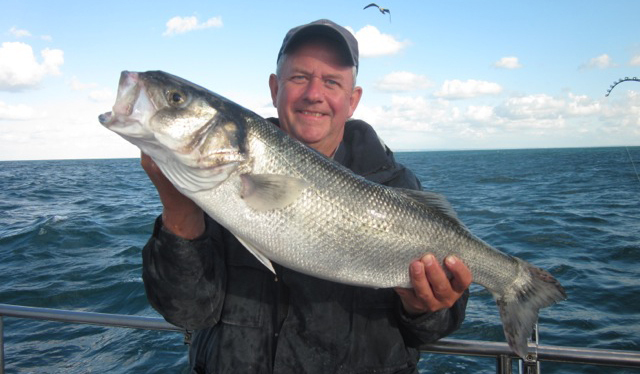 Yes, you'll catch plenty of Bass on a multiplier fished under a 12lb class Boat Rod or Uptider, and on some days when the tide is running hard and the 'Big Bass' are playing you'll probably need them to fish live Mackerel. Whilst balance gear is key, triplicate it's the terminal tackle that does the real talking. You can have the best Rod / Reel and the most expensive ultra strong and fine Japanese braid money can buy, but connect that lot to a heavy weight and just drag an inviting lure through the bottom gravels or sandbanks with no conviction will result in very few fish. Big Bass on Light Gear, anything better? Braided lines will help you stay connected to the lure and give you the paddle tail vibration back to the rod tip (in a poetic World anyway) but most importantly allow you to fish lighter leads, lighter equals smaller and smaller equals less spooked fish. Spooking fish is also why we use Fluorocarbon snoods, about 8ft is a good starting point and you can on some days end up fishing twice that! It's down to personal preference if you use a Fluorocarbon leader down to the leader, some do and some don't. Clearly there's an advantage in doing so, but keeping every simple is just as important. The only thing I'd add it ensure you use the same leader as you do for your snood, you'll reduce tangles and achieve a better presentation in the turbulent and often confused waters that Bass love to predate in. Rigs wise, things couldn't be simpler. 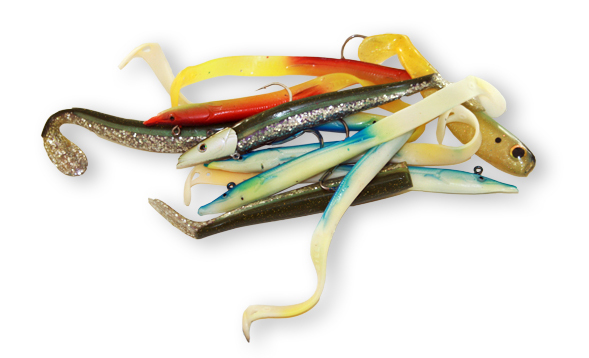 Some prefer a Portland style rig and others a simple boom, a smaller version of a Wrecking lure rig, but effectively it's much the same method of fishing, only for the Bass you're fishing over Sand Banks and not wrecks. The Portland rig is a simple as can be, a trapped swivel connects the snood to the 8 inch body with just a small clear beads either side that allows the swivel to move up and down the short rig body. A further swivel connects the rig body to the mainline and some like to employ a rotten bottom to connect the lead. Keeping things simple is key, the purist could argue a portland rig is two beads and two swivels too many, but I'm not a purist. Hook wise, the lure will sort itself out but if fishing with live Sandeel a 3/0 or 4/0 finewire Kamasan B940 isn't a bad starting point. 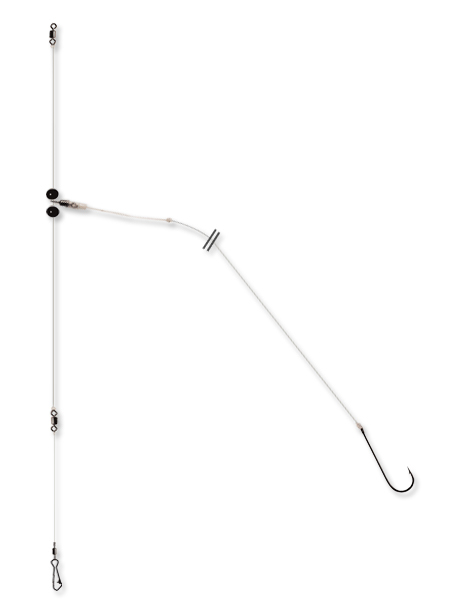 (or if you prefer a mustad 3261BLN ) A size 2 treble hook is best if live mackerel is the bait. It's often best for the anglers around the boat to fish the same size of lead down, a cannon ball will reduce spin and drag and expect to fish anything from 1-10oz. The less experienced anglers will benefit from fish an ounce or two more than others to stop a live bait wandering and reduce snagging others but don't go too extreme as that will also increase the angler-angler hookup! Reducing tangle ultimately increases fishing time and effectively the amount of fish you'll catch. After a nice controlled drop to the bottom (we want the rig to be in much the same state it left the boat in!) a couple of turns up and wait a moment to allow everything to align. If you get a huge smashing take at that point, well done. Smile and thank the fishing gods for letting today to be your day. Otherwise you're going to have to work our a fish or two. Speak to 'Me' the Skipper, I'll tell what sort of ground we're going over and when to expect the fish. Take note of those around you, especially the ones with a fish or two. If the tide is running well and you've a steady drift over sandbanks, look out for a sudden depth increase, that's the back of the bank and mostly likely where the Bass are ambushing Sandeel. Make sure you stay connected to the bottom by turning bringing the lure up 10-15 turns (the speed of which can be critical) and returning back to the bottom, if you know you're coming up to the 'drop off' try and get the lure right in there. The Savage Gear sandeel and Redgill 'Blue & White' will catch fish on most days, but there's no getting away from the stories of the best fish of the day taken on something totally different. If things are really hard and there's not too many bait fish about, then fishing a head hooked ragworm can often out fish any other bait and catch some very big Bass. Alternatively so will a small belly strip of mackerel fished on a smaller hook and fished closer to the bottom with also give you a chance of a bonus Brill or Turbot over the right ground. Work at your fishing and you'll be rewarded.